One of the best football seasons in the history of Hoquiam High School came to an end in the Class 1A state quarterfinals. The Grizzlies, champions of the 1A Evergreen League and the No. 3 seed in the state tournament, fell, 45-6, to sixth-seeded Lynden Christian at Stewart Field to close out the year with a record of 10-1. This year’s team, under second-year head coach Jeremy McMillan, became just the third Grizzlies team over the last 40 years to advance to the state quarterfinals. This year’s squad, which knocked off Stevenson, 49-0, in the first round, joins the Hoquiam teams from 1978 and 2015 in accomplishing the feat. Lynden Christian (10-2) jumped out to a decisive 42-0 lead in the first half, taking advantage of two costly early turnovers by the Grizzlies which the Lyncs turned into points. The Lyncs, whose two setbacks this season came against 1A state quarterfinalists Meridian (35-20) and Mount Baker (20-13), will take on No. 10 Newport in the semifinals. Newport is coming off a 7-6 upset of second-seeded Zillah in the quarterfinals. Elma, which lost, 40-21, to Meridian in the first round, and Montesano, which lost 48-7 to Mount Baker in the opening round, joined Hoquiam as 2018 Class 1A state participants, marking the first time ever all three programs competed in the state playoffs in the same season. Hoquiam starting quarterback Payton Quintanilla, who left the game in the second quarter against Lynden Christian due to an ankle injury, capped his high school football career by being named the 1A Evergreen League’s most valuable player. Quintanilla threw for 2,119 yards and 24 touchdowns, completing 153 of his 241 pass attempts (63.5 percent) with just five interceptions. Quintanilla was equally effective with his legs, rushing for more than 600 yards and five touchdowns. 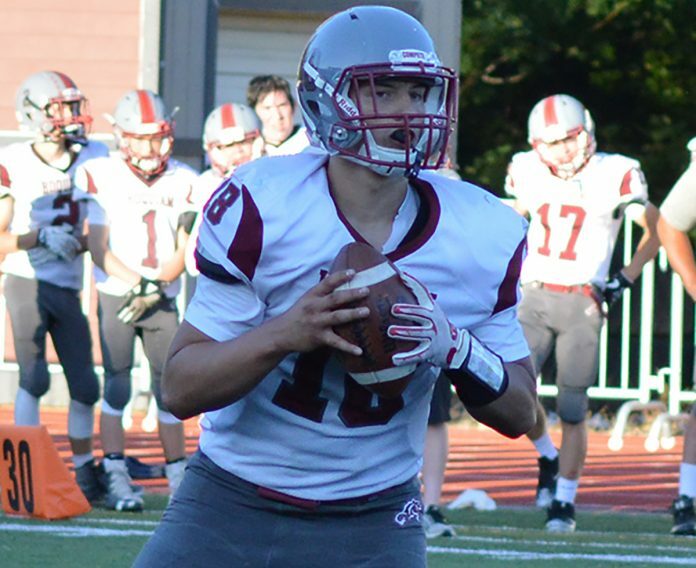 One of Quintanilla’s top performances this season came against rival Montesano in a game that eventually determined the league championship. The signal caller threw for 150 yards and three touchdowns and ran for 160 yards and a score in the Grizzlies’ 37-25 triumph over the Bulldogs. It was Montesano’s first league defeat since its 2015 loss to Hoquiam. The Grizzlies wrapped up the league title the following week, going on the road and hammering Forks, 42-13, in a game that saw Quintanilla throw for 255 yards and four TDs. Quintanilla also threw for a season-high 304 yards and three touchdowns in a 48-12 win over Tenino. Hoquiam junior linebacker Matt Brown, who amassed more than 100 tackles on the season, was named the league’s defensive most valuable player after spearheading a Grizzles’ defense which surrendered 17.3 points a contest and registered a 49-0 shutout of Stevenson in the opening round of the state playoffs. Quintanilla and Brown were both named to the first-team all-league team. Hoquiam also had first teamers in offensive lineman Caleb Larsen, wide receivers Dane McMillan and Jonah Doll, linebacker Brady Cummings and defensive back Jackson Folkers. McMillan and his assistant coaches were named the league’s coaching staff of the year. Elma’s sensational running Taitum Brumfield was named the 1A Evergreen League’s offensive most valuable player. The senior rushed for a league-leading 1,319 yards on 219 carries, averaging 6 yards a carry and scoring 23 touchdowns on the ground. Brumfield also caught six passes for 187 yards and two TDs as the Eagles finished with a record of 8-3 and advanced to the first round of the state playoffs for the first since 2005. Brumfield also received first team recognition as a defensive lineman. 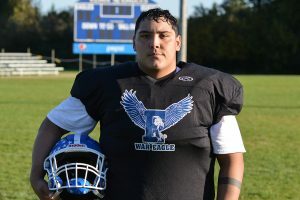 Brumfield’s teammate Alejandro Hernandez pulled off a rare all-league trifecta as the senior was named a first-team selection on all three teams, earning first team honors as an offensive lineman, defensive lineman and kicker. 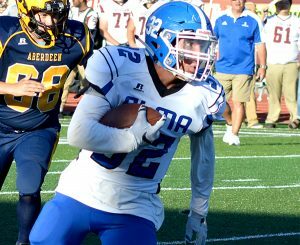 Additional Elma players named to the first team all-league squad were running back Brady Shriver, offensive lineman Jacob Garcia, linebacker Ben Sowers and defensive back Cody Vollan. The Bulldogs (8-3) also had first-team all-league selections in quarterback Shaydon Farmer, running back Teegan Zillyett, linebacker Brent Hollatz and punter Tanner Nicklas.